The Central Executive Committee of the Association met in New Delhi on 10th and 11th November 2014. The host unit RBEA New Delhi made excellent arrangements right from reception, accommodation, comfortable stay, venue for meeting, creating correct ambience for a trade union gathering displaying prominently banners etc. on our urgent issues like “Save RBI”, “Open public counters to extend public service”, against “shrinkage of RBI”, demanding “ Pension up-dation and fresh option” etc. Besides senior comrades-veterans of many a struggle, a number of new recruits enthusiastically volunteered to make the All India gathering a total success. RBEA New Delhi was appreciated by one and all and everyone carried back the message not to despair, but to carry on courageously. The Bank management also extended total support and we thank them. Deputy Governor Sri S.S. Mundra was the Chief Guest. General Secretary warmly welcomed him and narrated the chequered past of the Association’s more than nine decades long existence, its ceaseless struggles in defence of RBI autonomy , functions and against shrinkage, its continuous inculcation amongst members and employees in general of commitment to this great institution over career, its bitter experience of discrimination from the erstwhile dispensation, Association’s long pending issues before the Bank which cry for urgent solutions, and the demands for pension up-dation, fresh option and enhancement of meager ex-gratia quanta to pre-86 retirees. pursued by RBI officials with Government officials and he was hopeful for an early solution. He took note of our appeal on pre-1986 retirees. CEC felicitated Sri G. C. Kirtikar, our Advisor, for his election in the Parliament from Mumbai North-West constituency, wherefrom he has been elected by a huge margin. General Secretary and Chairman of the meeting Com A. N Subhedar spoke about Sri Kirtikar’s contribution to RBIEA Mumbai and AIRBEA as the General Secretary of the former and Vice President of the latter, for long. Both wished him success in his parliamentary responsibilities and take up the issues of RBI and its employees in the august forum. In response Sri Kirtikar profusely thanked the Association, its leadership from all units, his erstwhile colleagues, for their best wishes to him, stating, inter alia, that he had learnt a lot from his Association activities which had stood him in good stead in his social and political field, as former MLA from Maharashtra Assembly and Minister from that state. He said as MP he would be happy to be of service to RBI employees and retirees. He requested RBI not to close public counters and not to stop recruitment on plea of technology as our country suffers most from unemployment and RBI has a social responsibility. The CEC meeting was greeted by Sri A. K. Verma, Secretary, AIRBOA, New Delhi and Smt Rachna Dixit, President, RBIOA, New Delhi. Regional Director Sri Deepak Singhal welcomed the CEC members from all centres, wished them comfortable stay and hoped that the meeting would deliberate and decide on issues related to the great institution, RBI, He said that the industrial relation in New Delhi, particularly relation between the management and the Association, was very cordial and wished that to continue. The CEC then took up the issues of the agenda which mainly related to organizational tasks and unit wise activities since the last conference. The General Secretary placed that integrating the new recruits with the collective activities and perception of the Association, groom them for future leadership, activating the Association in all centres, continuous communication with the entire membership and mobilizing them for resolving issues are the most important tasks before the AIRBEA and units. He sought suggestions and opinion from all on these very important matters, particularly effective continuity of the Association which only would guarantee job security, progression and future. He emphasized how RBI was shrinking fast – its staff strength in the nineties of about 40,000 has dwindled to about 16,500, including recent recruitment in class III of about 1500. 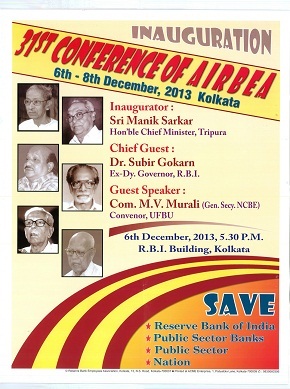 He also suggested to give Voice, journal of RBEA Kolkata, an all India shape and increase its readership everywhere. He said that AIRBEA would launch its website shortly. All units as well as office bearers of the Association seriously engaged in the discussion which continued for nearly nine hours; suggestions came how to rejuvenate the Association units everywhere, continuous communication with membership taking help of technology, if required, as also explaining to the new members Association’s persistent endeavours to resolve issues pertaining to new staff in particular and pending issues which have been taken up with the Bank but lie unresolved, due to Banks’ dilatory policies, mostly, and lackadaisical attitude sometimes. These issues have to be clinched. Suggestion came for improvement in Banks’ medical facilities, reasonable proportionalities in matter of perks/ fringe benefits etc, and issues related to promotees from class IV to class III. All these have been noted for follow-up. The meeting deplored the attitude of the Bankers in resolving the wage issues of bank employees and officers, who, at the call of United Forum of Bank Unions, have already observed a series of strike actions. The CEC have decided that if bank employees are forced into further agitation, AIRBEA, in consultation with AIRBWF, will jointly intensify supporting actions in RBI also, which the RBI management might take note. The CEC meeting inducted com. Kunal K. Landge as representative from RBEA Pune. The meeting concluded with stirring speeches from President Com. A. N. Subhedar and Working President Com. A. Govindasamy. Full-throated slogans of “AIRBEA Zindabad,” “United Forum of Reserve Bank Officers & Employees Zindabad” drew the curtains on successful CEC meeting of AIRBEA.